Developmental Editing of Nonfiction is an online eight-week class for editors interested in working with nonfiction authors. Each week, students will submit an assignment covering some aspect of developmental editing and receive personal feedback from the instructor. If you have some experience with editing but haven’t done much in the way of developmental editing, then this is the class for you. 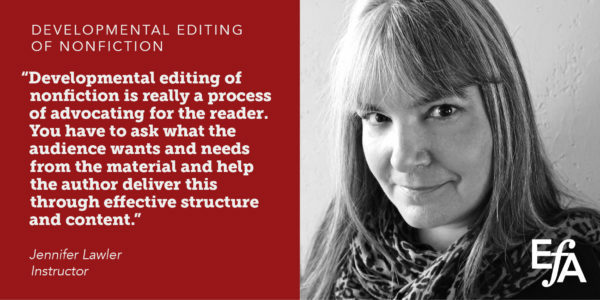 We’ll cover the basics of developmental editing (what it is and isn’t), the specifics of developmental editing in action, how to edit for the reader and the client, identifying developmental problems in nonfiction, and more. We’ll focus on book-length work for most of the course although for the first few weeks we’ll look at how to edit smaller (article-length) pieces. Note: This class does not cover the basics of getting started as a freelance editor, but the instructor is always willing to discuss this with students in Forum conversations. Week 1. Overview of developmental editor functions: what a DE is and isn’t. This week, we’ll focus on understanding the qualities and characteristics of a good DE and developing a professional author-editor relationship. We’ll also discuss dealing with plagiarism and related issues. Assignment: Constructing diplomatic queries. Week 2: Audience expectations. We’ll review various nonfiction works with the purpose of identifying the audience, understanding audience expectations, and identifying areas where the text does not meet the audience’s needs. Assignment: Perform a developmental edit on a short piece to ensure it meets audience expectations. Week 3. Meeting the client’s needs. This week, we’ll discuss how to understand an editor’s assignment letter (for article-length works) and determine whether the author met the stipulations, including a review of various types of assignment letters. Assignment: Determine if a specific document achieves its intended purpose by comparing it with its assignment letter and making specific developmental suggestions. Week 4. Developing your DE eye. We’ll cover specific problems common to book-length nonfiction manuscripts, such as disorganization, lack of coherence, privileging the wrong information, failing to connect the dots for readers, insufficient support for points, and uneven tone. Assignment: Do a developmental edit on a book chapter, balancing big-picture problems with sentence-level errors. Week 5. Working with book proposals. This week, we’ll cover the acquisitions process as it pertains to nonfiction books, since this impacts development. Most nonfiction books are sold based on a proposal, not a finished ms., so developmental editors need to be familiar with writing and editing book proposals (as you may be asked to perform these functions) as well as using them to guide the editorial process. Assignment: Assess a sample book proposal and suggest ways to improve it, keeping in mind client and audience. Week 6. The art of identifying what’s wrong. We’ll cover how to compare a final manuscript with the expectations of the publisher/client, author, and audience, using a book proposal and a sample ms. Assignment: Create an edit plan for a manuscript that doesn’t quite meet the publisher’s expectations. Week 7: The down and dirty. This week, we’ll dig into the nitty gritty of developmental editing of nonfiction, covering issues with tone, problems at the sentence level, understanding coding, and more. Assignment: Perform a developmental edit on a project with significant sentence-level concerns. Week 8. Type by type. This week, we’ll discuss the specific editing challenges that arise when working with a variety of nonfiction genres, from prescriptive self-help to cookbooks. Assignment: Write a revision letter for a how-to book (provided) or a nonfiction book/manuscript of your choosing. Instructor Jennifer Lawler has been an editor on a wide range of editorial projects for traditional book publishers as well as independent authors—everything from cookbooks to memoir to paranormal romance to thrillers. She launched Crimson Romance for Adams Media (now Simon & Schuster), overseeing all aspects of acquisitions, editorial, and production. She has also worked as a magazine editor for MSP Custom Publishing. She is the author or coauthor of more than forty nonfiction books and novels, including her popular and award-winning Dojo Wisdom series (Penguin). She has written a number of romances under three pen names. She worked briefly as a literary agent and has taught in the biomedical writing program at the University of the Sciences in Philadelphia, the copyediting program at the Univeristy of California–San Diego, and for the well-respected Loft Literary program in Minneapolis. She earned her PhD in medieval English literature from the University of Kansas and a black belt in Taekwondo at approximately the same time. She hasn’t quite decided which has been more helpful in her career.